The Sugarhill Gang's Henry "Big Bank Hank" Jackson has died at the age of 57, according to David Mallie, who manages the group's two remaining living members. Mallie confirmed to Fox News that Jackson died from kidney complications due to cancer. "[Wonder Mike and Master Gee] had been in contact with him in the past year," Mallie told Fox 411. "They had some great times and created history." The surviving members expressed their condolences: "So sad to hear of our brother's passing. Rest in peace, Big Bank," they said. 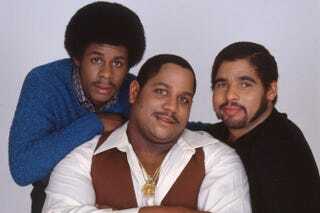 The Sugarhill Gang are considered the pioneers of rap music because of their 1979 hit "Rapper's Delight." The groundbreaking release is still highly sampled and referenced in today's rap music.